3 1. Introduction This Extended Warranty Insurance is designed to provide cover for the reasonable cost of necessary repair or replacement of the parts of your vehicle covered under this policy, when such repair or replacement is necessitated by the unforeseen failure of such parts during the period of cover. We offer a number of term options from which you are able to choose. Who is the insurer? The insurer of this policy is The Hollard Insurance Company Pty Ltd (Hollard) ABN AFS Licence Number Hollard is responsible for the content of this document. 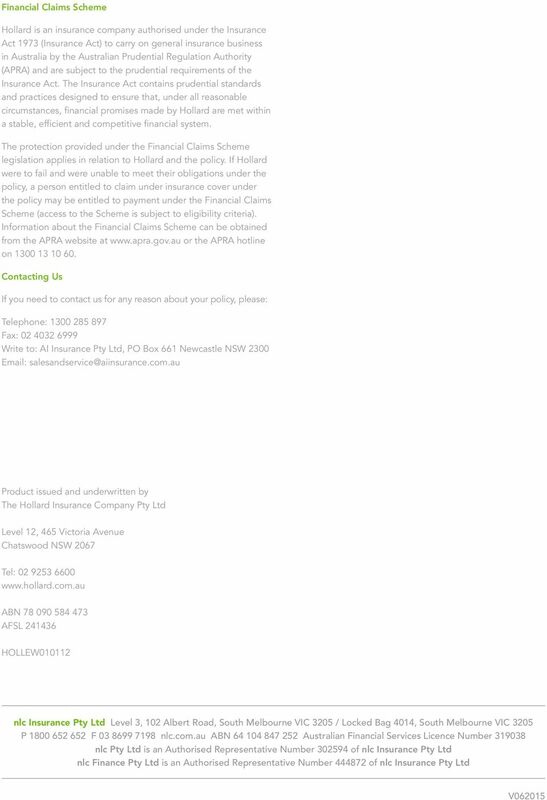 Hollard is authorised under the Insurance Act 1973 (Cth) to conduct insurance business in Australia. That Act establishes a system of financial supervision of general insurers in Australia and is regulated by the Australian Prudential Regulation Authority. Hollard is the holder of an Australian Financial Services licence issued under the Corporations Act 2001 and it is regulated by the Australian Securities and Investments Commission. Who administers this insurance? 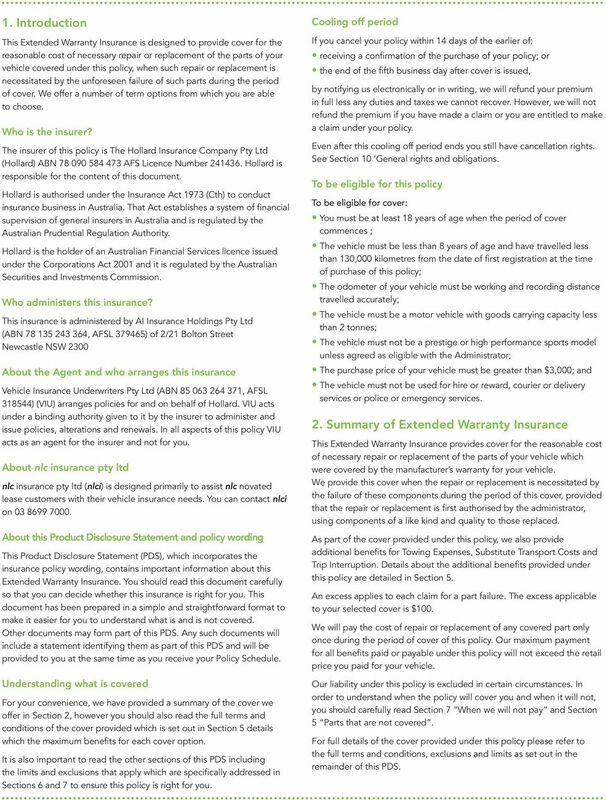 This insurance is administered by AI Insurance Holdings Pty Ltd (ABN , AFSL ) of 2/21 Bolton Street Newcastle NSW 2300 About the Agent and who arranges this insurance Vehicle Insurance Underwriters Pty Ltd (ABN , AFSL ) (VIU) arranges policies for and on behalf of Hollard. VIU acts under a binding authority given to it by the insurer to administer and issue policies, alterations and renewals. In all aspects of this policy VIU acts as an agent for the insurer and not for you. About nlc insurance pty ltd nlc insurance pty ltd (nlci) is designed primarily to assist nlc novated lease customers with their vehicle insurance needs. 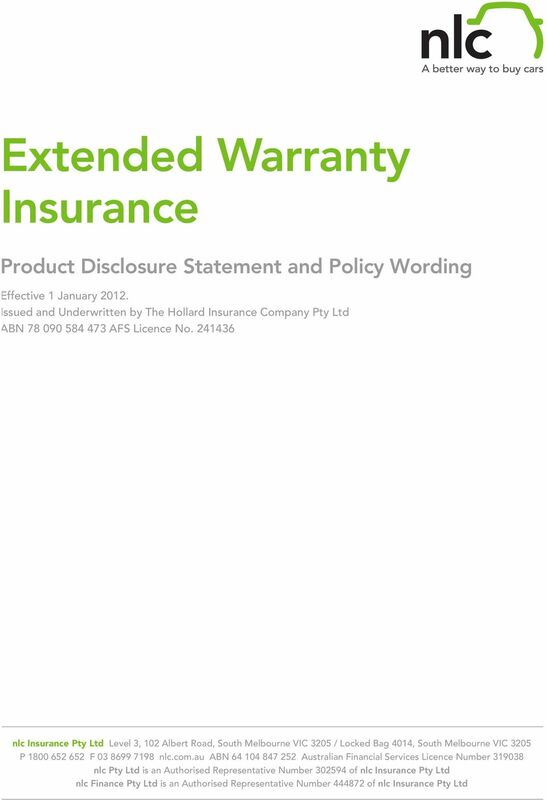 You can contact nlci on About this Product Disclosure Statement and policy wording This Product Disclosure Statement (PDS), which incorporates the insurance policy wording, contains important information about this Extended Warranty Insurance. 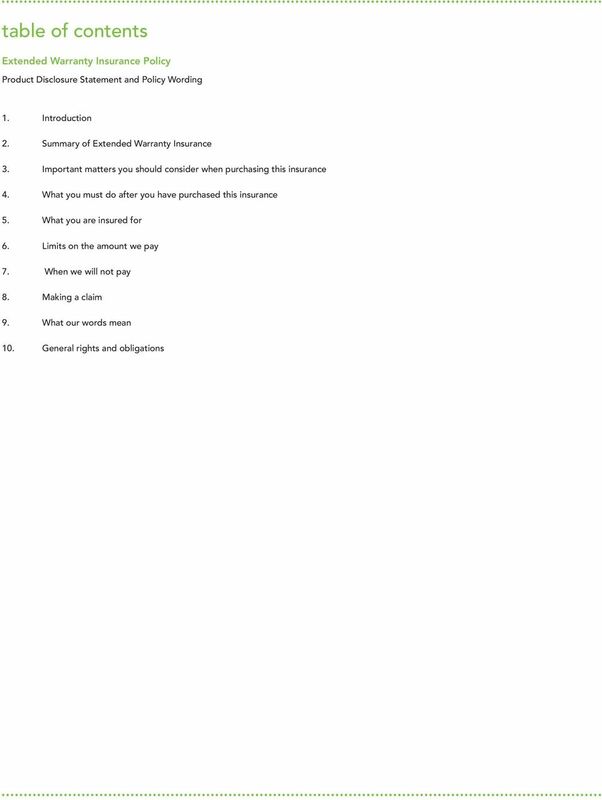 You should read this document carefully so that you can decide whether this insurance is right for you. This document has been prepared in a simple and straightforward format to make it easier for you to understand what is and is not covered. Other documents may form part of this PDS. 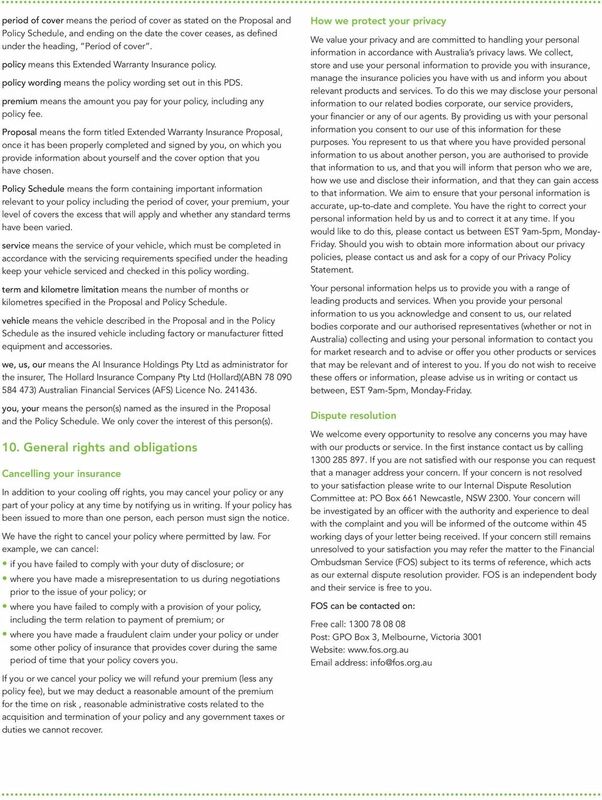 Any such documents will include a statement identifying them as part of this PDS and will be provided to you at the same time as you receive your Policy Schedule. Understanding what is covered For your convenience, we have provided a summary of the cover we offer in Section 2, however you should also read the full terms and conditions of the cover provided which is set out in Section 5 details which the maximum benefits for each cover option. It is also important to read the other sections of this PDS including the limits and exclusions that apply which are specifically addressed in Sections 6 and 7 to ensure this policy is right for you. Cooling off period If you cancel your policy within 14 days of the earlier of: receiving a confirmation of the purchase of your policy; or the end of the fifth business day after cover is issued, by notifying us electronically or in writing, we will refund your premium in full less any duties and taxes we cannot recover. However, we will not refund the premium if you have made a claim or you are entitled to make a claim under your policy. Even after this cooling off period ends you still have cancellation rights. See Section 10 General rights and obligations. To be eligible for this policy To be eligible for cover: You must be at least 18 years of age when the period of cover commences ; The vehicle must be less than 8 years of age and have travelled less than 130,000 kilometres from the date of first registration at the time of purchase of this policy; The odometer of your vehicle must be working and recording distance travelled accurately; The vehicle must be a motor vehicle with goods carrying capacity less than 2 tonnes; The vehicle must not be a prestige or high performance sports model unless agreed as eligible with the Administrator; The purchase price of your vehicle must be greater than $3,000; and The vehicle must not be used for hire or reward, courier or delivery services or police or emergency services. 2. Summary of Extended Warranty Insurance This Extended Warranty Insurance provides cover for the reasonable cost of necessary repair or replacement of the parts of your vehicle which were covered by the manufacturer s warranty for your vehicle. We provide this cover when the repair or replacement is necessitated by the failure of these components during the period of this cover, provided that the repair or replacement is first authorised by the administrator, using components of a like kind and quality to those replaced. As part of the cover provided under this policy, we also provide additional benefits for Towing Expenses, Substitute Transport Costs and Trip Interruption. Details about the additional benefits provided under this policy are detailed in Section 5. An excess applies to each claim for a part failure. The excess applicable to your selected cover is $100. We will pay the cost of repair or replacement of any covered part only once during the period of cover of this policy. 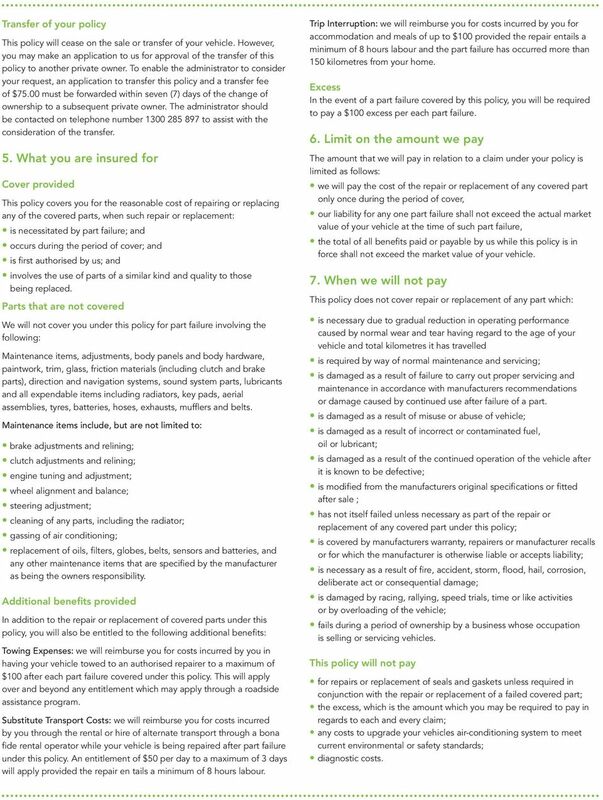 Our maximum payment for all benefits paid or payable under this policy will not exceed the retail price you paid for your vehicle. Our liability under this policy is excluded in certain circumstances. In order to understand when the policy will cover you and when it will not, you should carefully read Section 7 When we will not pay and Section 5 Parts that are not covered. For full details of the cover provided under this policy please refer to the full terms and conditions, exclusions and limits as set out in the remainder of this PDS. 4 3. Important matters you should consider when purchasing this insurance Decide what cover suits you best You must decide what cover suits you best. In making your decision, you should carefully read this PDS. In doing so you should remember there are limits on the amount we pay (see Section 6), and circumstances where we will not pay claims (see Section 7) that apply to all types of cover. Your Proposal and your Policy Schedule contain important information relevant to your policy including the period of cover, your premium, your level of cover, the excess that will apply and whether any standard terms have been varied. This PDS and your most recent Proposal and your Policy Schedule and any endorsements and or amendments that we provide you with will make up your policy with us. You need to keep these documents in a safe place together with receipts and other documentary evidence we may require. Comply with your duty of disclosure We rely on the information you provide us to decide whether to insure you and the terms on which we will insure you. Before you enter into a contract of general insurance with us, you have a duty under the Insurance Contracts Act 1984 (Cth) to tell us everything that you know, and which a reasonable person in the circumstances could be expected to know that is relevant to our decision whether to insure you and, if so, on what terms. This is your duty of disclosure. You have the same duty to disclose those matters to us before you extend, vary or reinstate a contract of general insurance. You do not have to tell us anything that is common knowledge or that we should know through the ordinary course of our business that reduces the risk of a claim or that we tell you we do not need to know. If you fail to comply with your duty of disclosure, we may reduce or deny any claim you make and/or cancel your policy. If you fraudulently keep information from us or deliberately make false statements we may void your contract and treat your insurance as if it never existed. Period of cover The period that your vehicle will be covered under the policy is as follows: Cover will commence one day after the expiry of the manufacturers warranty or dealer warranty period, or in the case of your vehicle not being covered by a manufacturer s warranty or dealer warranty, cover will commence from the lease settlement date. This date will be shown on your Proposal and your Policy Schedule as the commencement date. Cover will cease at the earliest of: when your vehicle has reached the term noted on the Proposal and the Policy Schedule or 200,000 kilometres from the date of first registration, whichever occurs first; or the time of cancellation of your policy; or the time your ownership of your vehicle ends; or as otherwise indicated in this policy. How we determine your premium The cost of the policy is called the premium. We calculate your premium based on various factors including the model, age and value of your vehicle, the cover options and the period of cover that you select. It also includes an amount that takes into account any policy fee, compulsory government charges and or taxes (e.g. stamp duty and GST) Once your Policy Schedule has been issued it becomes your receipt for the amounts you have paid with respect to your policy. Acceptance of your policy Your policy is accepted from the time you submit your Proposal and pay your premium. You must also comply with your duty of disclosure. Once your Proposal is received by us, we may accept or decline cover within 30 days. If we decline cover we will advise you in writing and issue a full refund of premium less any government charges that we cannot recover. Where this is the case, cover will cease 7 days after the date on which we mailed the notice to you. If we accept your application a Policy Schedule will be forwarded to you. 4. 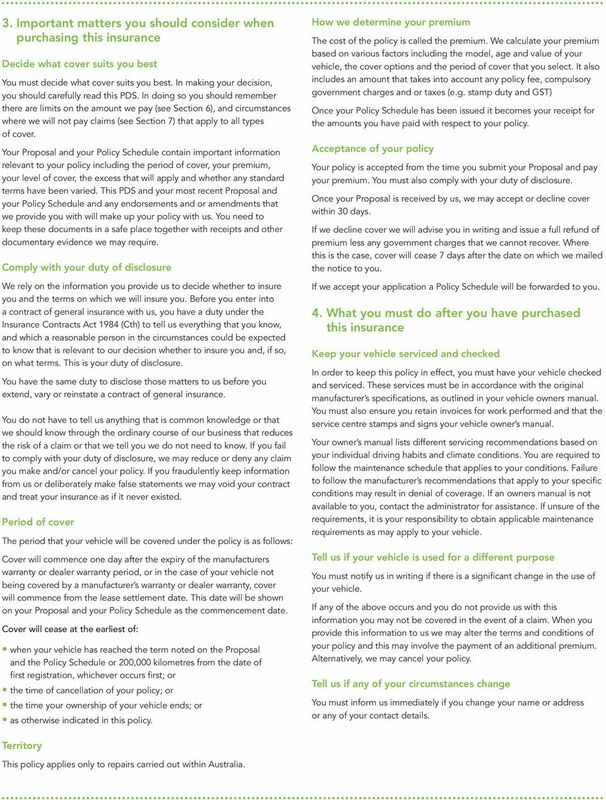 What you must do after you have purchased this insurance Keep your vehicle serviced and checked In order to keep this policy in effect, you must have your vehicle checked and serviced. These services must be in accordance with the original manufacturer s specifications, as outlined in your vehicle owners manual. You must also ensure you retain invoices for work performed and that the service centre stamps and signs your vehicle owner s manual. Your owner s manual lists different servicing recommendations based on your individual driving habits and climate conditions. You are required to follow the maintenance schedule that applies to your conditions. Failure to follow the manufacturer s recommendations that apply to your specific conditions may result in denial of coverage. If an owners manual is not available to you, contact the administrator for assistance. If unsure of the requirements, it is your responsibility to obtain applicable maintenance requirements as may apply to your vehicle. Tell us if your vehicle is used for a different purpose You must notify us in writing if there is a significant change in the use of your vehicle. If any of the above occurs and you do not provide us with this information you may not be covered in the event of a claim. When you provide this information to us we may alter the terms and conditions of your policy and this may involve the payment of an additional premium. Alternatively, we may cancel your policy. Tell us if any of your circumstances change You must inform us immediately if you change your name or address or any of your contact details. Territory This policy applies only to repairs carried out within Australia. 5 Transfer of your policy This policy will cease on the sale or transfer of your vehicle. However, you may make an application to us for approval of the transfer of this policy to another private owner. To enable the administrator to consider your request, an application to transfer this policy and a transfer fee of $75.00 must be forwarded within seven (7) days of the change of ownership to a subsequent private owner. The administrator should be contacted on telephone number to assist with the consideration of the transfer. 5. What you are insured for Cover provided This policy covers you for the reasonable cost of repairing or replacing any of the covered parts, when such repair or replacement: is necessitated by part failure; and occurs during the period of cover; and is first authorised by us; and involves the use of parts of a similar kind and quality to those being replaced. Parts that are not covered We will not cover you under this policy for part failure involving the following: Maintenance items, adjustments, body panels and body hardware, paintwork, trim, glass, friction materials (including clutch and brake parts), direction and navigation systems, sound system parts, lubricants and all expendable items including radiators, key pads, aerial assemblies, tyres, batteries, hoses, exhausts, mufflers and belts. Maintenance items include, but are not limited to: brake adjustments and relining; clutch adjustments and relining; engine tuning and adjustment; wheel alignment and balance; steering adjustment; cleaning of any parts, including the radiator; gassing of air conditioning; replacement of oils, filters, globes, belts, sensors and batteries, and any other maintenance items that are specified by the manufacturer as being the owners responsibility. Additional benefits provided In addition to the repair or replacement of covered parts under this policy, you will also be entitled to the following additional benefits: Towing Expenses: we will reimburse you for costs incurred by you in having your vehicle towed to an authorised repairer to a maximum of $100 after each part failure covered under this policy. This will apply over and beyond any entitlement which may apply through a roadside assistance program. Substitute Transport Costs: we will reimburse you for costs incurred by you through the rental or hire of alternate transport through a bona fide rental operator while your vehicle is being repaired after part failure under this policy. An entitlement of $50 per day to a maximum of 3 days will apply provided the repair en tails a minimum of 8 hours labour. Trip Interruption: we will reimburse you for costs incurred by you for accommodation and meals of up to $100 provided the repair entails a minimum of 8 hours labour and the part failure has occurred more than 150 kilometres from your home. Excess In the event of a part failure covered by this policy, you will be required to pay a $100 excess per each part failure. 6. Limit on the amount we pay The amount that we will pay in relation to a claim under your policy is limited as follows: we will pay the cost of the repair or replacement of any covered part only once during the period of cover, our liability for any one part failure shall not exceed the actual market value of your vehicle at the time of such part failure, the total of all benefits paid or payable by us while this policy is in force shall not exceed the market value of your vehicle. 7. When we will not pay This policy does not cover repair or replacement of any part which: is necessary due to gradual reduction in operating performance caused by normal wear and tear having regard to the age of your vehicle and total kilometres it has travelled is required by way of normal maintenance and servicing; is damaged as a result of failure to carry out proper servicing and maintenance in accordance with manufacturers recommendations or damage caused by continued use after failure of a part. is damaged as a result of misuse or abuse of vehicle; is damaged as a result of incorrect or contaminated fuel, oil or lubricant; is damaged as a result of the continued operation of the vehicle after it is known to be defective; is modified from the manufacturers original specifications or fitted after sale ; has not itself failed unless necessary as part of the repair or replacement of any covered part under this policy; is covered by manufacturers warranty, repairers or manufacturer recalls or for which the manufacturer is otherwise liable or accepts liability; is necessary as a result of fire, accident, storm, flood, hail, corrosion, deliberate act or consequential damage; is damaged by racing, rallying, speed trials, time or like activities or by overloading of the vehicle; fails during a period of ownership by a business whose occupation is selling or servicing vehicles. This policy will not pay for repairs or replacement of seals and gaskets unless required in conjunction with the repair or replacement of a failed covered part; the excess, which is the amount which you may be required to pay in regards to each and every claim; any costs to upgrade your vehicles air-conditioning system to meet current environmental or safety standards; diagnostic costs. 6 8. Making a Claim If your vehicle is in need of repair, you must take the following steps to make a claim: 1. Take immediate action to prevent further damage. This policy will not cover the damage caused by you not securing a timely repair of the covered part. 2. Contact the administrator on before any repairs are commenaced. The administrator will offer advice on getting your vehicle to the nearest authorised repair facility. It is your responsibility to have your vehicle towed to the repair facility. 3. Provide the authorised repair facility with a copy of this policy and/or your policy number. 4. Instruct the service manager of the authorised repair facility to obtain authorisation from us through the administrator prior to any repair or disassembly of your vehicle being undertaken. The administrator will only authorise repairs on our behalf that are carried out by a licensed repairer that has an ABN and is registered for GST. The amount authorised by the administrator is the maximum that will be paid for repairs covered under the terms of the policy. Any additional amount will be your responsibility. 5. In some cases, you may need to authorise the authorised repair facility to inspect and/or disassemble your vehicle in order to determine the cause and cost. The administrator reserves the right to require an inspection of your vehicle prior to any repair being carried out. You will be responsible for these charges if the part failure is not covered under the policy. 6. After the administrator has been contacted, they will review with the service manager of the authorised repair facility what will be covered by the policy and what portions of the repair (if any) will not be covered. 7. Please note that the repair may be completed with parts of like quality and kind, commensurate with the age and odometer reading of your vehicle at the time of the part failure. In some cases, remanufactured or used parts may be utilised. 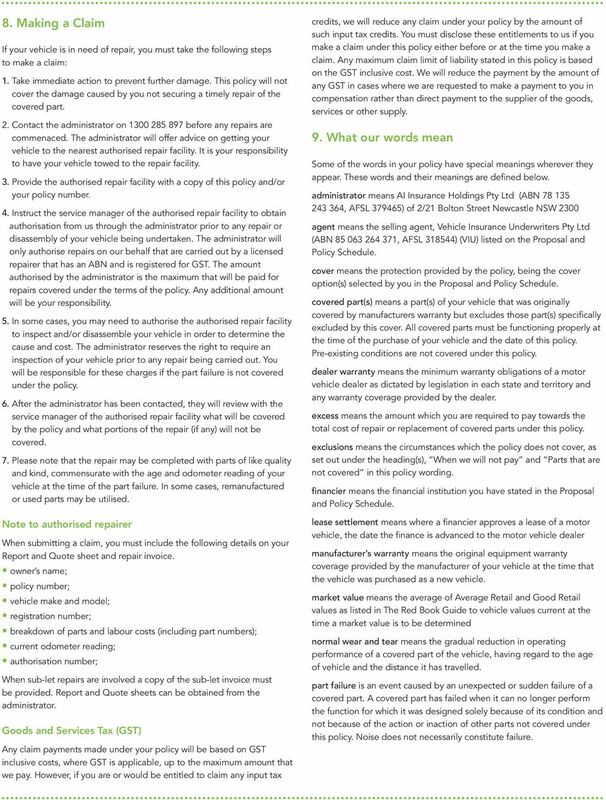 Note to authorised repairer When submitting a claim, you must include the following details on your Report and Quote sheet and repair invoice. owner s name; policy number; vehicle make and model; registration number; breakdown of parts and labour costs (including part numbers); current odometer reading; authorisation number; When sub-let repairs are involved a copy of the sub-let invoice must be provided. Report and Quote sheets can be obtained from the administrator. Goods and Services Tax (GST) Any claim payments made under your policy will be based on GST inclusive costs, where GST is applicable, up to the maximum amount that we pay. However, if you are or would be entitled to claim any input tax credits, we will reduce any claim under your policy by the amount of such input tax credits. You must disclose these entitlements to us if you make a claim under this policy either before or at the time you make a claim. Any maximum claim limit of liability stated in this policy is based on the GST inclusive cost. We will reduce the payment by the amount of any GST in cases where we are requested to make a payment to you in compensation rather than direct payment to the supplier of the goods, services or other supply. 9. What our words mean Some of the words in your policy have special meanings wherever they appear. These words and their meanings are defined below. administrator means AI Insurance Holdings Pty Ltd (ABN , AFSL ) of 2/21 Bolton Street Newcastle NSW 2300 agent means the selling agent, Vehicle Insurance Underwriters Pty Ltd (ABN , AFSL ) (VIU) listed on the Proposal and Policy Schedule. cover means the protection provided by the policy, being the cover option(s) selected by you in the Proposal and Policy Schedule. covered part(s) means a part(s) of your vehicle that was originally covered by manufacturers warranty but excludes those part(s) specifically excluded by this cover. All covered parts must be functioning properly at the time of the purchase of your vehicle and the date of this policy. Pre-existing conditions are not covered under this policy. dealer warranty means the minimum warranty obligations of a motor vehicle dealer as dictated by legislation in each state and territory and any warranty coverage provided by the dealer. excess means the amount which you are required to pay towards the total cost of repair or replacement of covered parts under this policy. exclusions means the circumstances which the policy does not cover, as set out under the heading(s), When we will not pay and Parts that are not covered in this policy wording. financier means the financial institution you have stated in the Proposal and Policy Schedule. lease settlement means where a financier approves a lease of a motor vehicle, the date the finance is advanced to the motor vehicle dealer manufacturer s warranty means the original equipment warranty coverage provided by the manufacturer of your vehicle at the time that the vehicle was purchased as a new vehicle. market value means the average of Average Retail and Good Retail values as listed in The Red Book Guide to vehicle values current at the time a market value is to be determined normal wear and tear means the gradual reduction in operating performance of a covered part of the vehicle, having regard to the age of vehicle and the distance it has travelled. part failure is an event caused by an unexpected or sudden failure of a covered part. A covered part has failed when it can no longer perform the function for which it was designed solely because of its condition and not because of the action or inaction of other parts not covered under this policy. Noise does not necessarily constitute failure. Tyre & Rim Insurance. Product Disclosure Statement and Policy Document.